A couple of weeks ago Manchester City Council finally agreed to keep a promise it had made in February – for quarterly reports on its climate plan “progress”. This came after a two week blitz of blog posts about the Council’s broken promises, and ahead of the May 2015 elections. 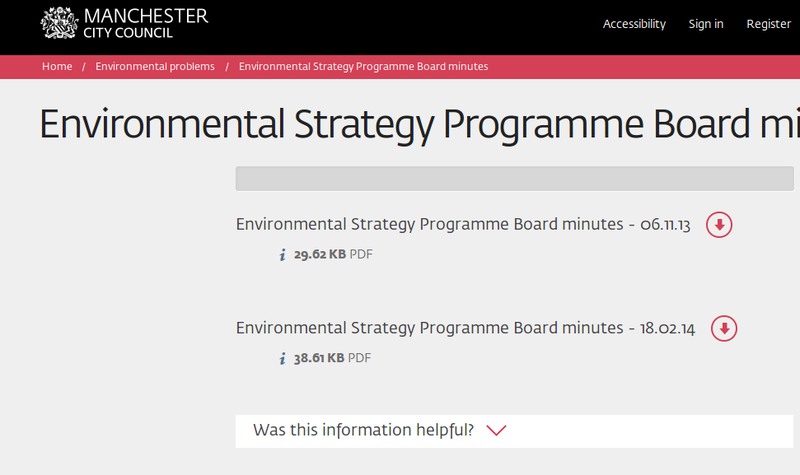 One promise in the email various citizens received was that minutes of the Environmental Strategy Programme Board (a not-open-to-the-public meeting of senior Council officers and some councillors) were available on the Council’s website. A link was provided. Well, either that assurance was wrong, or the ESPB didn’t meet between February and October. Which is it? More importantly, what will the promised quarterly plans actually contain? Will there be acknowledgement that selling off council buildings and warm winters have helped? Will they generally try to spin the numbers/shift the baselines? Will an explanation be given for why the Town Hall extension lights are on seemingly 24/7 be given? Will the numbers of councillors who are carbon literate be given, with their names? Will there be an explanation of the factors behind the failure to deliver the training efficiently be given, and a credible plan for future actions? Will OTHER actions towards goal two be mentioned? Will the 18 recommendations of the Environmental Sustainability Subgroup be included? (People’s Environmental Scrutiny Team came up with a series of detailed implementation plans for these 18 recommendations. These were helpfully rubbished by a councillor). Will there be a timed goal for first the Environmental Dashboard? Will there be an acknowledgement that most of Manchester’s 32 wards don’t have ward plans, and the few that do have no climate mitigation or adaptation element? Will the plan be readable and clear? Ten days ago Manchester Climate Monthly asked Councillor Jeff Smith if he would be willing to meet to discuss this. He has not yet replied. Write to your councillors, raising these questions. When the first report comes out, read it, come up with questions, send them to your councillors. Come to the next meeting of the People’s Environmental Scrutiny Team – Monday 15th December, 7pm at the Friends Meeting House. The theme of the meeting is “learning public speaking and vide0-making”. If you are interested in both, one, or neither, it will still be a useful meeting for you! This entry was posted in Climate Change Action Plan, Democratic deficit, Manchester City Council, quarterly reports. Bookmark the permalink.